Traveling internationally is an expensive affair. Tourists need to prepare for their dream destination keeping in mind the flight costs, commuting, lodging and food expenses required during their stay. The cost of travel accessories such as action camera, smartphones, mobile wi-fi for sharing their activities on social media needs to be estimated. Most importantly, calculating the cost of using a robust sim card that provides calling and data services during travels is a must. Reducing the cost of international traveling might be difficult but one can easily reduce their international roaming charges substantially by selecting the correct local sim card. To help travelers avoid being misled in selecting a wrong sim card, we have meticulously brought together key points that will greatly assist them in selecting the right local sims for their travels. The first and foremost thing to keep in mind while packing for your holiday getaway is deciding the country you are going to visit. For visiting a single country, buying a local SIM Card is a really smart choice. It will save any tourist a considerable amount of money. On the other hand, visiting multiple countries, say when a visitor tours Europe, an international sim card would be a cheaper option. After you have finalized your country of travel, all you need to do is select a versatile local sim card. Buying a local sim card right off the bat when you land at an airport might not be a wise idea. Many sim card vendors are offering services that are even cheaper than the local sims available. It would be better to buy a country specific sim card before you start your travels. These local sim cards are offering better calling and data services at the lowest price than the native country's available networks. For instance, there are local sim cards being offered by WorldSIM which cost even less than the visiting country's native sim cards. These local sim cards include countries like Thailand, Vietnam, Malaysia, USA/Canada/Mexico, South Africa, Australia/New Zealand and for Asia. You can know more about them here. Another most common mistake made by travelers who prolong their stay in any visiting country is not using a Bundle Plan. A local sim card has a limited validity after which it needs to be topped up. Extending your stay during travels will shoot up your sim card usage costs. A simple solution to avoid these exorbitant travel costs is using Bundle Plans. A Bundle Plan simply put is a collection of data and calling services together customized according to a user. Tourists can use more data and calling minutes along with validity on using the correct Data Bundle. Another mistake frequently done by travelers is not understanding their data & call usage. Most of us like to use more data services than calling someone in a day. Selecting a plan that provides more calling minutes than data can easily result in a bill shock to travelers. The reverse is also true for people who love to talk more than be online. For instance, the USA/Canada/Mexico local sim card offers 1 GB data with 1000 calling minutes initially. For data savvy travelers the plan is pretty much useless and may exhaust in less than a day if used lavishly. People used to spending more time online can instead use the 5 or 10 GB bundle plan instead for seamless connectivity that lasts days if not weeks. Every country has a telecommunication technology widely used by the masses. For instance, US mobile operators deploy 4G on the band (1700, 2100 MHz) for its mobile phones. Few countries use 850 MHz for 3G services while most of the countries in the world use 900, 2100 MHz for mobile communications. Travelers need to find out whether their smartphones are compatible with the telecommunications of the country they are visiting. Besides the compatibility of the smartphone, tourists also need to make sure that their phone is sim unlocked else they won’t be able to use the local sim cards of the visiting country. This is another silly mistake often done by travelers. Every country has its own dialing format. The UK starts with +44 while India has the code of +91. It is better for travelers to familiarise with the visiting country’s correct dialing format else they will have to waste plenty of minutes connecting with their local sim card operator's customer care support for such a trivial issue. All it takes is a simple google search to discover the correct dialing format of the country you are currently visiting! Exorbitant international roaming charges are a thing of the past thanks to the seamless global telecommunication services provided by WorldSIM. We have been providing international coverage in over 200 countries and free incoming services in 118. 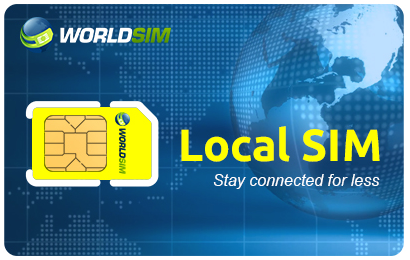 Our latest offering the WorldSIM Local Sim Card offers travelers calling and data services at the native country’s prices (in some cases even cheaper!). Our country specific sim cards are compatible in any unlocked device and they are also triple punched so they fit any SIM slot (i.e. standard, micro, and nano).